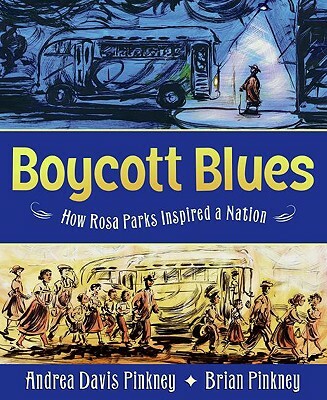 Boycott Blues: How Rosa Parks Inspired a Nation (Library Binding) | Let's Play Books! This story begins with shoes. This story is all for true. This story walks. And walks. And walks. Rosa Parks took a stand by keeping her seat on the bus. When she was arrested for it, her supporters protested by refusing to ride. Soon a community of thousands was coming together to help one another get where they needed to go. Some started taxis, some rode bikes, but they all walked and walked. With dogged feet. With dog-tired feet. With boycott feet. With boycott blues. And, after 382 days of walking, they walked Jim Crow right out of town. . . .
Andrea Davis Pinkney and Brian Pinkney present a poignant, blues-infused tribute to the men and women of the Montgomery bus boycott, who refused to give up until they got justice. Andrea Davis Pinkney is the author of many acclaimed picture books and young adult novels. She received a Coretta Scott King Author Honor Award for Let It Shine. Her collaborations with her husband, Brian Pinkney, include Peggony-Po; Sleeping Cutie; Ella Fitzgerald: The Tale of a Vocal Virtuosa; Dear Benjamin Banneker; and the Caldecott Honor and Coretta Scott King Illustrator Honor book Duke Ellington: The Piano Prince and His Orchestra. She is a children's book editor at a major publishing company. She lives with her family in Brooklyn, New York. Brian Pinkney has illustrated numerous books for children, including two Caldecott Honor books, The Faithful Friend, by Robert D. San Souci, and Duke Ellington: The Piano Prince and His Orchestra, by Andrea Davis Pinkney. Mr. Pinkney's own books include Hush, Little Baby; Cosmo and the Robot; Max Found Two Sticks; JoJo's Flying Side Kick; and The Adventures of Sparrowboy, winner of the 1997 Boston Globe-Horn Book Award. Brian Pinkney has received the Coretta Scott King Award for illustration and three Coretta Scott King Honor Awards. He lives with his wife, Andrea, and their children in Brooklyn, New York.